Home » Treatments » Characteristics of Down Syndrome, the Physical Characteristics of Down Syndrome – What do they look like? Characteristics of Down Syndrome, the Physical Characteristics of Down Syndrome – What do they look like? 1… How are the characteristics of a baby with Down Syndrome unique or different? 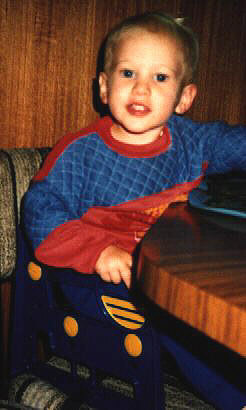 2… Does a kid with the characteristics of Down Syndrome look normal? Does a kid with Down Syndrome look like their parents? What about the unique family features? Photo Quiz included! 4… What are the adult physical characteristics of Down Syndrome? 5… Fixing, correcting and adjusting the physical characteristics associated with Down Syndrome. Making the physical characteristics of Down Syndrome go away. 1… So, what are the characteristics of Down Syndrome, of a baby with Down Syndrome, that typically makes them physically different from most babies? A baby with Down Syndrome looks pretty much the same as any other baby mostly – For the most part, it takes a well trained eye to spot Down Syndrome characteristics in a baby. There are around 13 characteristics of Down Syndrome in a baby. These Down Syndrome characteristics are normally hard to detect by a parent. Frequently you will be told your baby has Down Syndrome, before you are even aware of it. The attractive eyes were the only sign, the only physical characteristic of Down Syndrome, we noticed with Jacob and we just put that down to normal variation. We didn’t think he had Down Syndrome after he was born; didn’t notice any of the characteristics of Down Syndrome as being Down Syndrome. 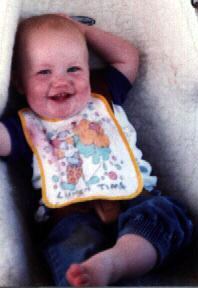 A baby with Down Syndrome may present with the characteristics more obvious, but I think you will see the baby. They are NOT ugly, they are NOT hideous. They are a perhaps a little different with some of their characteristics. A little more unique, but after saying that, you’ll probably notice no difference, no characterisitcs of Down Syndrome. 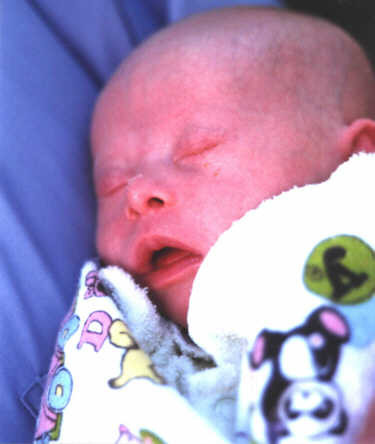 However, the following Down syndrome features are features that are very, very typical of a someone with Down Syndrome, but a person with Down Syndrome may NOT have all these features present. Attractive Almond-shaped eyes, with one eye lid a little droopy. Slightly flattened bridge across nose. Smallish ears, positioned slightly lower on the head, with a small fold at the top of the ear. Horizontal crease in palm of hand . The little finger curves inward . Slightly enlarged gap between the big and second toes. Also, in the newborns that have to have open-heart surgery, a chest scar becomes a common Down Syndrome characteristic. 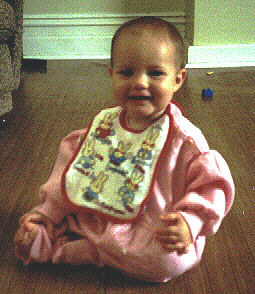 2… Characteristics of Down Syndrome – Down Syndrome Appearance: Who do they look like when they are little? The characteristics of young Down Syndrome kids can and do differ in extent. A young Down Syndrome kid looks pretty much like most other kids. If you haven’t seen a picture of Jacob yet, before you mouse over them, see if you can tell which one has Down Syndrome. How many characteristics of Down Syndrome can you see in the pictures? If you know which one is Jacob, try it with a friend or family member. See if they can get it right. From Left to Right, Dad, Jacob, Hannah, Mum, Donny, Christopher and Johnathan. 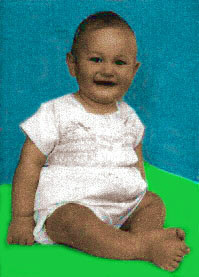 The answer: At one year of age, Jacob looks like all of us! Or, rather, you can see the family characteristics in him. Yes, you can see the characteristics of Down Syndrome as well, but the family resemblence is remarkable. The 13 physical characteristics of Down Syndrome did NOT stop him from looking like the rest of us. Just in case: Down Syndrome picture is the 2nd from the left in the top row. Many of the 13 characteristics of Down Syndrome can be seen, but the physical characteristics of Down Syndrome are insignificant to the beholder. 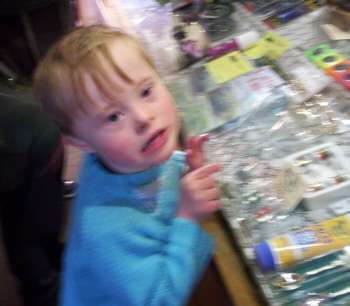 3… Children with Down Syndrome : Characteristics of Down Syndrome Kids. I’ve found that as Jacob gets older, some Down Syndrome characteristics appear to be more obvious on some days than others – on some days he doesn’t even look Down Syndrome at all – even though all the physical Down Syndrome characteristics are still there of course. This makes it difficult to assess treatments for Down Syndrome, like Mannatech glyconutrients, when people make claims the person’s Down Syndrome physical characteristics have improved. When I see Jacob, a five and a half year old boy, the features of Down Syndrome aren’t normally very apparent to me. It’s in the photo’s that I see the characteristics of Down Syndrome more. It might seem odd to you now, as a new parent or parent to be, but, even though the effects on his intelligence are obvious, I don’t really see it. I see my little boy. In fact, when I start getting frustrated with him, I have to remind myself that he has Down Syndrome. I still pray every night for him to be free of Down Syndrome, that is one of my duties as his parent and guardian, but I don’t really see Down Syndrome in him, I see him. 4… Adults: Characteristics of Down Syndrome Adults. Going on adult people with Down Syndrome I see, I know that they are typically shortish and fattish and I think that is how most people picture them. Of their Down Syndrome facial features, the prominant facial characteristic is fat faces! 5… Fixing, correcting and adjusting the physical characteristics associated with Down Syndrome. Making the physical characteristics of Down Syndrome go away – It’s all in the eye of the beholder. If we control the two prominent characteristics of Down Syndrome – fatness and shortness – their Down Syndromeness perhaps wont be so apparent. It’s also not healthy being overweight. So, we don’t provide Jacob with a fattening diet. Incidentally, Down Syndrome individuals, according to one study, consume about 300 calories per day more than they should. So, if your adult kid is overweight, you might like to look at our best weight loss program, which is all about rapid weight loss. Growth hormones have problems and are currently contraindicated in kids with Down Syndrome, which is a pity. Any way, next time you are out and about, keep your eyes peeled for those with Down Syndrome and see if you agree with me. Imagine them a bit thinner ( that is, normal in weight for their height ). Then let me know what you think. Another big determiner of a Down Syndrome characteristic appearance, believe it or not, appears to be the hair style! One lady, talking sarcastically, made a flippant comment how every person with Down Syndrome she saw in Canada had the bowl style hair cut. I looked around here where I live in Australia and she was spot on. Most of the kids with Down Syndrome, most of the adults with Down Syndrome, most of the males with Down Syndrome and most of the females with Down Syndrome that I saw characteristically had the same bowl style haircut. There is a reason for this, I think it is terribly hard to get them still enough and cooperative enough to have a normal haircut – such as short back and sides. People have come to associate a certain hair style as a physical characteristic of Down Syndrome, but hair style is a very modifiable characteristic. By modifying this characteristic of Down Syndrome, hair style, their appearance is seen as more normal. When we style Jacob’s hair to short back and sides, he definitely looks a lot less Down Syndrome and there are times when you just wouldn’t pick any Down Syndrome in him. The 13 characteristics of Down Syndrome are still there, but they DON’T tend to be the characteristics of Down Syndrome that people associate with Down Syndrome people! 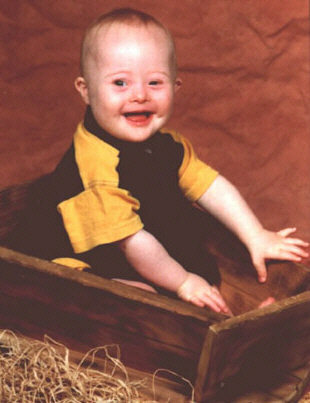 Down Syndrome phenotypic features are normally relatively unimportant in the look of a kid with Down Syndrome. So how do you cut the hair of kids with Down Syndrome? Well, Jacob is not agreeable to hair cuts either. In fact a hair cut may be done bit by bit over several days. A lot of the hair we thin out by using a small hair cutting comb – a comb with a razor safely inbedded in it that can in NO way cut skin; you can buy them at many shops, including many ladies hair dressers. They can sometimes pull the hair a little, but we persevere with Jacob and eventually get it thinned out enough over several days. Once we have it thinned, several of us hold him so that I can cut his hair safely. We try to make it pleasant for him, but it doesn’t really achieve much as he still squirms and tries to get away. In time I’m sure he’ll enjoy the hair cut, but until then it is a struggle. If you have any suggestions on how we could do this better, please let us know!!! By the way, we have always given Jacob short back and sides when ever we could – it is the normal male hair style in my family, so the hair cut is part of the normalising process; we expect him to be one of us. As an update, several years later and Jacob – age 7 years – now asks to have his hair cut! Carolyn and I oppose plastic surgery to alter the physical characteristics of Down Syndrome in kids. Plastic surgery is a painful process and, to be honest, we didn’t see much improvement in any Down Syndrome phenotypic features of one kid that had it. If you were to pursue plastic surgery to remove any of the 13 physical characteristics of Down Syndrome, could you please provide us with before and after photos? 3 Responses to "Characteristics of Down Syndrome, the Physical Characteristics of Down Syndrome – What do they look like?" 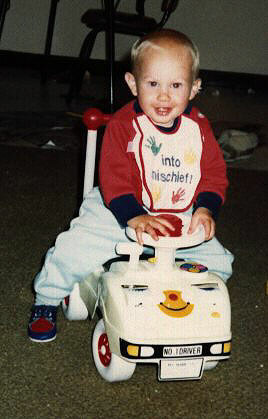 Jacob is adorable! My downs daughter just turned 40 and is the joy of my life. She is moderately developmentally disabled – IQ only 38, but that doesn’t hold her back. When she was born I was told she might never walk, talk or be potty trained but I was also told the best advice: Treat her as I would any other child. Love her, guide her and teach her. Not only can she walk, talk and is potty trained, today she has “graduated” from her special program, works in a sheltered workshop, dances in a special needs tap & jazz class, bowls in a special needs bowling league, participates in Special Olympics, does numerous arts and crafts and much more. She makes her bed every morning, cleans her bedroom – including changing linens every week, can cook simple meals in the microwave, can wash dishes, etc. True, she is slower at these things that you or I would be, but she never gives up. What a blessing she has been to our family. I’m sure Jacob is a blessing to yours as well. Wonderful. Really good to hear. May the Heavenly Father be with you all always.